The third in an increasingly erratic series. Today, our trusty burnisher. 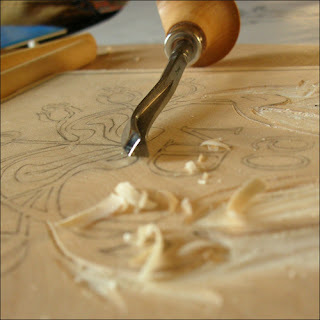 People print their relief prints using all kinds of methods. In essence all you need to do is tranfer the ink onto the block, and then off again on to the paper. Simple. In practice its not always so easy. Just pressing the block onto the paper usually results in a patchy mess, some areas overinked and others not inked at all. For those with lots of money and plenty of room the best way round this is to buy a printing press. For the rest of us the answer is hand-burnishing, selectively applying pressure to the back of the paper to press it evenly onto the block and encourage the ink to stick to it. Traditionally this is done with a japanese tool known as a 'baren', some good examples of which can be seen here. Other people (including us on occasions) use the rounded back of a spoon to get the same effect. Clare Leighton, for example, recommended in her 1932 book Wood Engravings and Woodcuts that wood engravers ought to burnish their prints with an ordinary teaspoon in order to get the maximum subtlety of tones from their inking. 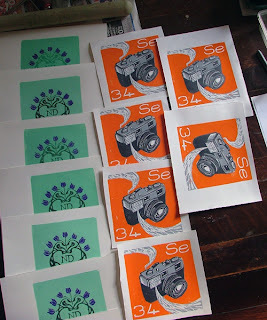 As you can see from the pictures, my Selenium print is now finished. Hooray! This one shows all the stages in the process of printing it layer by layer. The final image was made up of two blocks and three colours. The first block just provided the bright orange background and the lettering, with a space left for the camera. This was carved from a second block, firstly to give the light grey underprinting, and then, after a bit more cutting, the final layer of dark grey to pick out all the details on the camera. 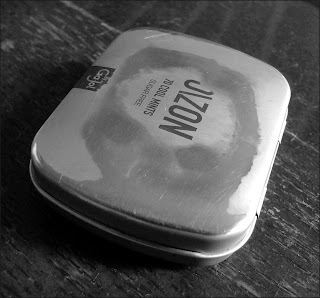 Neodymium will be completed imminently. Watch this space! See more here on Flickr, and also here on gfoots webpage. The sun has been shining on Norwich almost continuously since our last post, and we have been out in the garden enjoying it - planting potatoes, radishes, tomatoes, chillis, herbs and much more! 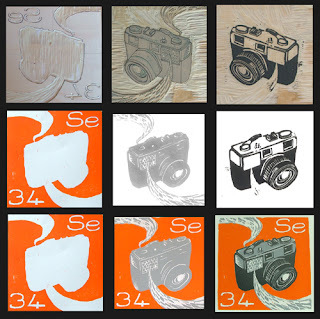 We have been working hard on our ideas for the Periodic Table printmaking project - I am doing Neodymium and Jon chose Selenium. 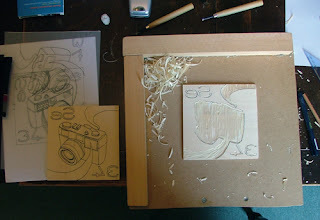 We are both doing woodcuts, and started cutting the blocks today! Neodymium is used used to colour enamels and glass, so I based my design on Art Nouveau enamel jewellry and glass designs - the final colour scheme hasn't quite been decided yet, but I'm looking forward to using my new gold printing ink in some way, shape or form! Selenium was used in the honeycomb-style lightmeters of old cameras, hence the vintage camera in Jon's print. Hopefully they should be printed by the end of the week - the other completed prints are appearing on this web page as they are finished. Spring is well and truly sprung in Norwich now, it was so warm last Wednesday that we had our lunch out in the garden to enjoy the sunshine (before the conker tree comes into full leaf and blocks it out). The first of the purple sprouting brocolli is ready to eat, the lawn's been reseeded and last year's compost looks like being a fine vintage! 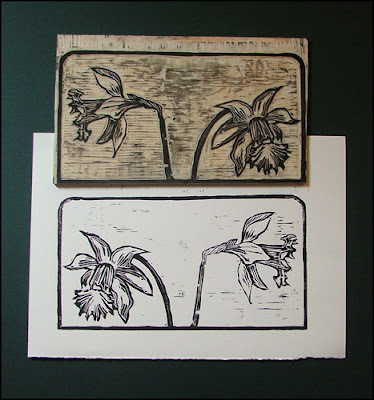 All this has inspired a suitably Spring-y print, a woodcut of two daffodils (see below). It started out as being four flower heads, but got reduced down to 2 as that seemed to work better, even if it makes it look like they've had a fight and are no longer talking to eachother! Japanese plywood is great to work with, easy to cut but still strong enough to hold sharp lines and fine details. Our tools are a bit of a mixed bag at them moment. The fine lines are done with a dedicated woodcut tool that looks like its escaped from a backstreet surgeon's bag c.1750, while the clearing work is done with some super-cheap chisels from the bargain bin of Norwich's premier alladin's cave of hardware, Thornes. Still, they seem to work nicely together!